Melodiya presents an unusual interpretation of Johann Sebastian Bach’s sonatas for viola da gamba and harpsichord. Written during the Cöthen period (1717-23), the sonatas, along with the solo suites for cello, violin and harpsichord, are the highest chamber instrumental accomplishments of the great German master. Today they belong to the golden repertoire of cello music, although at times they are played on other stringed instruments. Yuri Medianik, a versatile talent (he plays the bayan and violin, conducts and arranges), made a rendition of Bach’s sonatas for cello and … bayan. The cello part is performed by Boris Andrianov, one of the best cellists of the new generation, a brilliant representative of Natalia Shakhovskaya’s school and prize-winner of the International Rostropovich Cello Competition in Paris and the International Tchaikovsky Competition in Moscow. The combination of instruments that may appear strange at first sight is found attractive by many contemporary composers owing to the timbral similarities. Yuri Medianik’s repertoire encompasses very different styles and directions, and this is not the first time he has turned to Bach’s music. While the author of the arrangement preserves the original text as much as possible, he showcases the broad capabilities of the bayan as an academic concert instrument. Yuri Medianik’s arrangement has drawn the attention of a number of instrumentalists, but is released here for the first time. 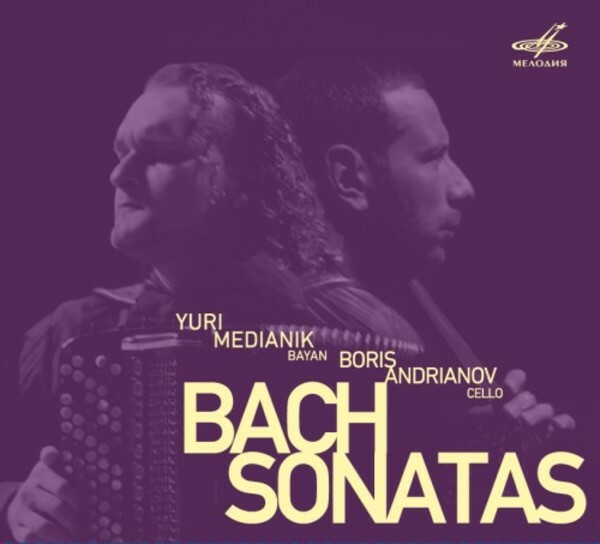 This new interpretation of Bach’s sonatas performed by top-class soloists will indeed be a decoration to any music collection for sophisticated professionals and a broad circle of music lovers alike.